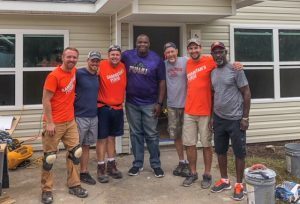 Well today concluded our Mission trip in Pearland, Texas and it was a great week of serving and fellowship with other Christ followers. 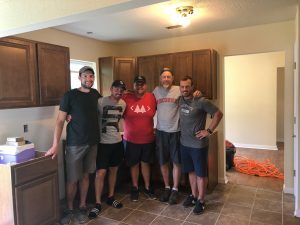 We met some incredible other people of God’s kingdom and were able to help a home owner get closer to getting back into her newly rebuilt home. Where we started on Monday to the progress we made on Friday was truly amazing and we praise God. We were blessed to see the home owner and “little Willy” one final time and get a picture with them in front of their home. 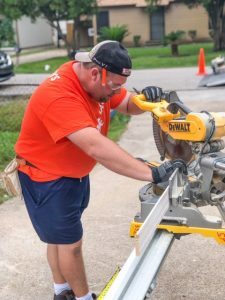 We were also blessed to learn some new skills and witness how God is using us and many more of his followers to impact the Houston area community. We ask for prayers on our final journey back to Madison and continued prayers for the Houston area as many people are still recovering from Hurricane Harvey. Finally, we thank everyone who has supported us and our families before and during this trip and appreciate all the positive comments on the blog throughout the week. It was great reading them throughout the week to keep us going. 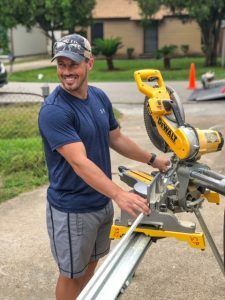 If you subscribed to the blog stay tuned because we are going to stay in contact with the site coordinator and try to get some pictures of the house all finished in the next couple weeks. As I reflect on the week I wanted to share a few experiences and take the time to give a few shout outs to a few people. We haven’t interacted with our homeowner much this week but the interactions we have had have been great. I can’t share her personal story with you through this medium but trust me when I say to you that she is one strong woman that has gone through some struggles recently. It has been awesome to know that we are able to tangibly do something to help her move back into her home. It is awesome to be there in the finishing stages. If you know construction much we are in the phases that you see at the end of the day. It may be tedious and “slow” but this is what she will come home to every day and see. We are volunteering with a large group of men from Pennsylvania. It is amazing to see how well they all get along and work together. 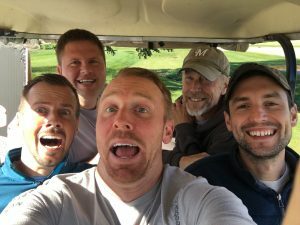 We have heard some amazing stories of how God has been moving in their lives and it is refreshing to see such a large group of men so committed to their walks with Christ. I want to say thanks to my team Scott, Paul, CJ and Jon. 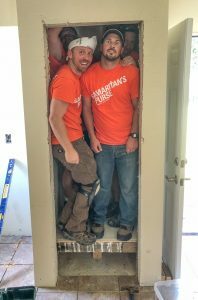 This is an awesome group of guys that are willing to do anything they are asked to do. As I watch them all work together it is just an awesome experience to witness. A special thanks to my wife Melissa. It isn’t just me that is on this trip. It is both of us that are committed to me taking teams to respond to the calling I’ve had put on my heart. 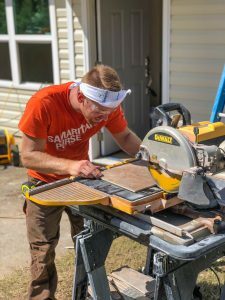 Without her encouragement and strength I wouldn’t have begun working with Samaritan’s Purse just a few years ago. I want to say thanks to our wives (Kate, Heidi, Blair, Melissa and Rachel). Sorry if I misspelt any names. Thanks for allowing your husbands to go on this trip. I know how hard it can be to juggle all of the activities and responsibilities without your spouse at home. I truly appreciate you doing this for your husbands this week. I want to say thanks to the impact staff at Blackhawk (Susan and Maddie) and whoever else was involved with taking a chance on me for this trip. It is humbling to call myself a team lead and to be responsible for something like this. The staff at Blackhawk put structure around this process that made the planning and execution of this trip so much easier. Lastly I wanted to say thanks to all the people that have written comments on our page, provided financial assistance and most of all are praying for us. Your comments are encouraging to us and the prayers are felt and appreciated. 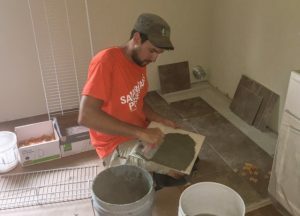 Today marked our final full day here in Pearland, Texas and it is amazing to see how much progress we have made in the home since arriving there Monday morning. 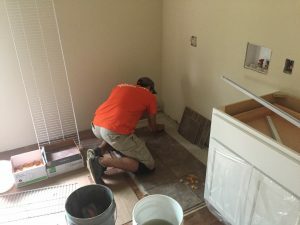 We continued our progress with baseboard trim, tile work, and other little details. 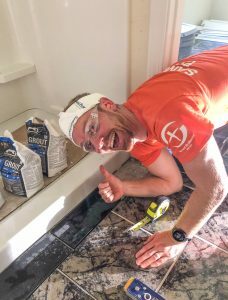 Brad, CJ and Paul are official baseboard and quarter round trim masters while Jon and Scott are official tile masters. 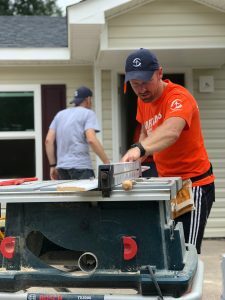 We have definitely gained experience in things we can utilize in future mission trips. We got another visit from Willy, the homeowner’s son, and he brought one of his friends along, Garrett. 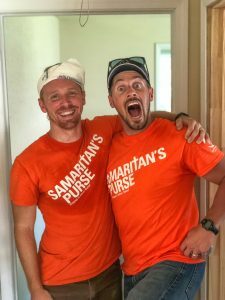 Willy had been sharing the story his mom has been going through with Samaritan’s Purse and wanted Garrett to witness it for himself. 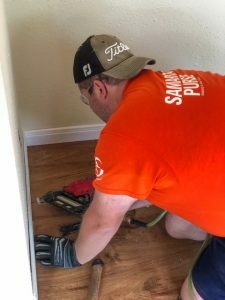 It was another reminder that the work we are doing stretches beyond just the homeowner. As we approach our final day on working, we ask for continued prayers for safety while working tomorrow and safe travels back home. 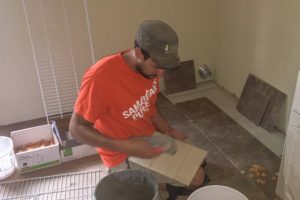 We also ask for prayers for our families back home as they finish up holding the house down while we have been here in Texas. Thanks for all the support and prayers throughout the week and we hope you have enjoyed our daily updates. We will share a final update tomorrow and hope you enjoy some more pictures of today’s work!!! 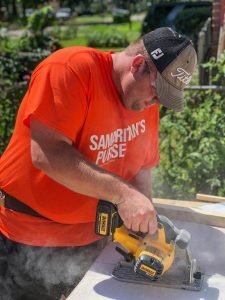 Today marked our second day on the job site which meant continuing the work we started on day 1 and even beginning some new tasks. 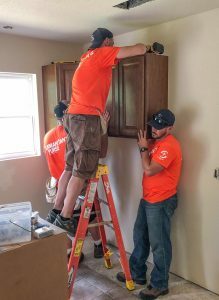 Brad, CJ, and Paul did a great job finishing hanging and setting kitchen cabinets and are now at professional status for cabinetry. 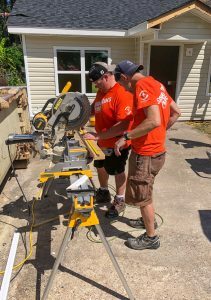 Jon and Scott began working on baseboard trim while fighting the heat and humidity while outside cutting. 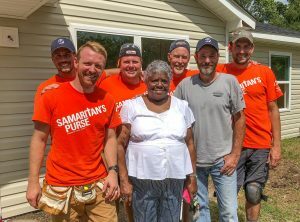 After lunch we had the pleasure of getting to meet the home owner who stopped by as she always tries to do each week as new volunteers come through to work on her home. It was a true blessing to get to hear her story and learn a little bit about her. 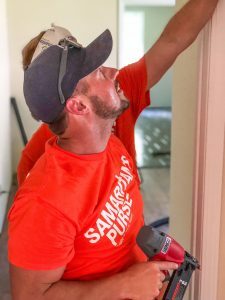 She is in great spirits and extremely grateful for the work Samaritan’s Purse is doing to help her get back into her home. It is moments like this where you take a step back to be thankful for all God has done and provided for us. 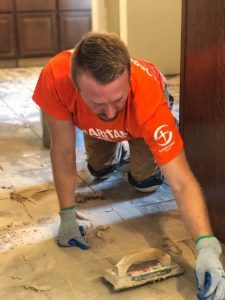 We ask you to keep this homeowner and all those who will continue to work on her home in your prayers. 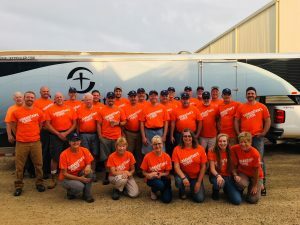 With only half of the trip left, we also ask for continued prayers for safe travels to and from the site, safety while on the site, and positive spirits as we all continue taking on new and unfamiliar tasks. We would like to thank everyone who has continued to pray for us and we truly appreciate all the responses on the blog as the words of encouragement keep us going as we get closer to the end of our trip. Our journey to Pearland, Texas began earlier this morning at 7 am where we were met with a good amount of rain in the first few hours of driving. 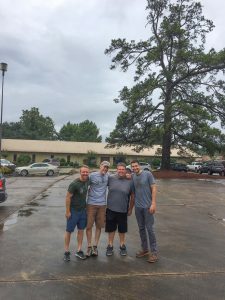 Our journey took a quick detour as we decided to make a stop at the church that our senior pastor worked at back in the 80’s and 90’s, Shreveport Bible Church (see pictures). It was a great stop and we took a few minutes to see if any of the staff or members remembered him and we did find some who remembered. After our quick detour we got back on the road to get a bite to eat and watch the Packer game. The Packer game didn’t end up how we would have liked, but Paul was happy as the Bears ended up winning. 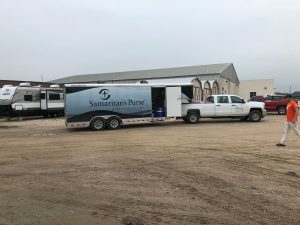 With only a couple hundred miles to go, we began our final drive to Pearland, Texas to get checked in and settle in at the host church. 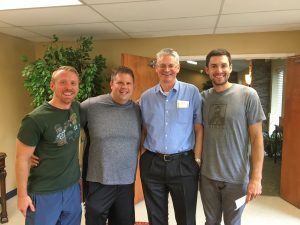 Upon arrival to the host church site, we got settled into our living quarters for the week as we get prepared for the serving that God has called us to do. We ask for your prayers tomorrow as we go through orientation and are on site for our first day. We ask for your prayers for safety and that God will use us to show that He is the light. We look forward to sharing stories this week on how God is using us to share the good news. 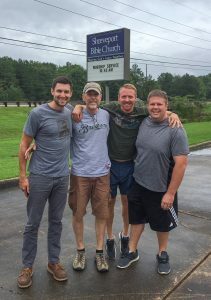 Today began our driving journey to Pearland, Texas where we met at Blackhawk Church to be sent off by two of the elders, Jeff and Scott, and our awesome impact director Susan. Before hitting the road the elders prayed for our Mission trip and we even had the pigeons join in on the prayer as they began chirping once prayer began. The goal for today’s drive was to make it to our overnight destination so we could finish off the driving to Texas on Sunday. During our quest to our overnight destination, we had many little stops on the way from breakfast at the IHOP to Walmart so we could get an auxiliary cable so we could stream music in the car. We capped the evening off with some great barbeque at The Mean Pig. Jon even tasted their extreme hot sauce (he may have tears coming from his eyes). We appreciate everyone’s thoughts and prayers and we will back on the road early tomorrow morning to finish our quest to Pearland, Texas.